West Coast SignWorks designs and produces high end custom signs for business. The company’s owners had recently redesigned their logo to reflect their philosophy of elegance and simplicity in design. They recognized the value of a strategically focused Web site in their branding and business-building efforts. 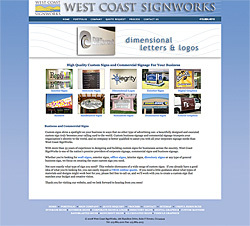 The Web site Polaris Interactive designed and produced for West Coast SignWorks closely adheres to the strategy outlined by the partners, presenting the company as a highly professional and reliable service oriented organization whose products are well designed and competitively priced.